The redevelopment of Agar Grove in Camden is set to become the UK's largest residential Passivhaus development when complete, and in May 2018 it took a major step towards that end as the first block of 38 homes achieved Passivhaus certification. 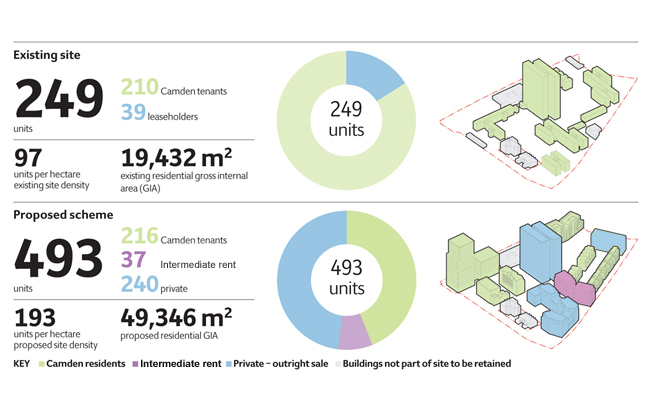 Built in the 1960’s bounded by a busy road and two mainline railways, the 249-home estate in Camden is part of the Council’s Community Investment Programme and will almost double the amount of housing available on the same site after regeneration. The phasing of the scheme allows the option for most tenants to be decanted from their old housing block to new homes as and when they are completed. Achieving the airtightness on this scale is easier in many respects, but much harder to test for. To achieve the required levels of airtightness, the construction team undertook the largest ever pressure test of its kind in the UK. The test took a full day, with eight separate fans and miles of cabling and pressure tubes across the complex shape and layout of the building. Retaining a core group of skilled workers on site was pivotal to the successful delivery, and rare for larger construction sites visited by several sub-contractors. I’m absolutely delighted that the Hill team have successfully completed the first phase of this ground-breaking project. It has been a very steep learning curve for us and I think it’s fair to say that we’ve had to go back to basics in some areas to learn how to build to these sorts of standards. The teamwork across the whole site has been fantastic and it’s great to be able to see Camden residents moving into to their new super-healthy and efficient homes. We’re now eager to move on and start the next phase. Paul Ansell, Hill Production Manager - London Region. The next phase, 1B, consists of a new-build accommodating 60 homes and is currently under construction retaining Hill as main contractor. It is hoped that Agar Grove will prove the relevance of Passivhaus in the UK, and its viability in volume housebuilding.